KitCore and KitPacks for 32-bit recording software has been replaced by DrumCore 4 and DrumCore 4 content for 64-bit recording software. Owners of KitCore and KitPacks who upgrade to DrumCore 4 will be provided with a Content Migration Tool. KitCore Deluxe Download is a plug-in based on the MIDI drum instrument in DrumCore, with tons of great MIDI beats. Use them in your songs royalty free. Use with VSTi/RTAS/AU hosts such as Acid, Cubase, Digital Performer, Live, Logic, Pro Tools and Tracktion (32-bit versions only). KitCore works with many 32-bit hosts, but does not work with 64-bit hosts. See DrumCore 4 AAX/VST3/AU plug-in for Pro Tools 11 and many other 64-bit hosts. 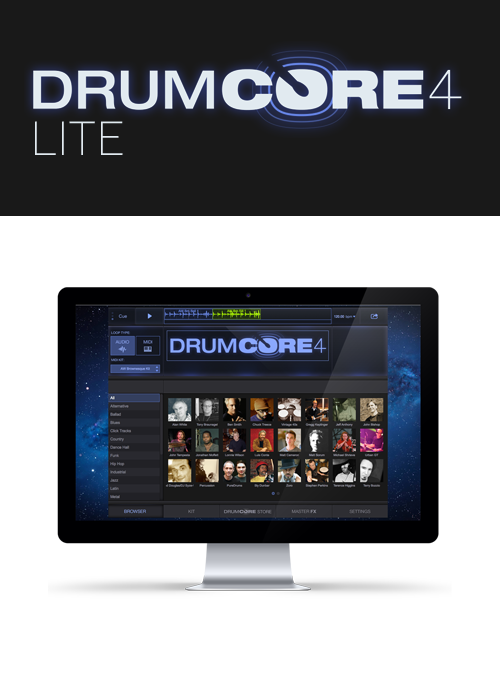 There is a KitCore to DrumCore 4 Upgrade path if you would like to buy this now and upgrade to DrumCore 4 later. KitCore does not work with RiffWorks. If you are looking for great drums for RiffWorks, check out the RiffWorks InstantDrummer category. KitCore Deluxe offers much more content than KitCore. KitCore Deluxe bundles the KitCore v2 plug-in with several great KitPack expansion packs. 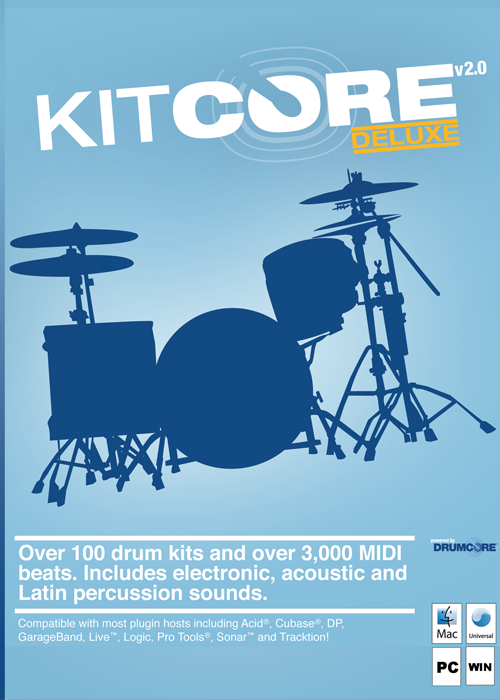 Over 100 DrumKits and 3,000 MIDI drum files are included, compared to the 8 kits that come with the standard KitCore ($49). These drummers' kits are included with KitCore Deluxe: John Tempesta (metal), Greg Keplinger (jazz), Louis Conte (Latin), Lonnie Wilson (country), Matt Cameron (pop, rock), Matt Sorum (alt, rock), Michael Shrieve (rock), and more! The KitCore v2 plug-in and $220 worth of the following add-on KitPacks are included with this KitCore Deluxe v2 download. If you have KitCore Deluxe, you do not need to purchase any of these add-on KitPacks. Listen to audio previews below. Want more? Click on the KitPack names here for more audio previews of each product bundled in KitCore Deluxe. Using the best of digital and analog, the kit's tone is burned-in at the sample level for great sound with minimal CPU load. From priceless Pultecs to vintage Neumann micsget the sound of a multi-million dollar studio on your laptop. You won't want those 44.1kHz/16 bit sounds again. Expand your KitCore library with even more KitPacks ($10-$125/ea.). KitCore and KitPack are trademarks and brands of Sonoma Wire Works.